I thought I’d share with you how we built our Maypole this year. I have a friend who’s called me “the Pagan Martha Stewart” due to my love of cooking, gardening, and general do-it-yourselfing. Still, when I brought the Maypole to the campout and told everyone I got the instructions to make it from Martha Stewart, they were very amused. We did make some modifications to Martha’s basic design. The base of the pole. Martha says to sink the pole in the ground, which was not an option for us. 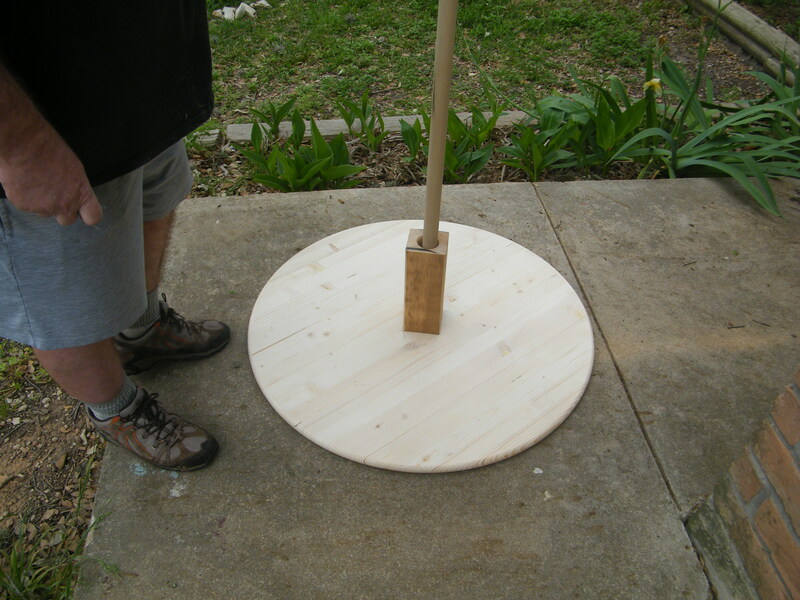 She says as an alternative you can use a patio umbrella stand, but instead my husband said he could make a base out of wood. We found a wooden tabletop at Lowes in their woodworking section and used that. He attached a piece of cedar 4×4 he already had in the garage, and drilled a hole in it to insert the pole. Making the hole perfectly vertical turned out to be difficult, so he ended up making the hole wider than it needed to be, then using a wedge to get the pole to stand straight. That turned out to be an even better option because then we could adjust to compensate for any slope the land might have. We also got the pole itself from Lowes. They had 10 foot poplar poles which were just the right size. For the top of the pole, we used a finial which my husband already had in his stash, but we couldn’t find 6 inch wooden disks at the craft store, so used 4 inch ones instead, which seemed to work fine. 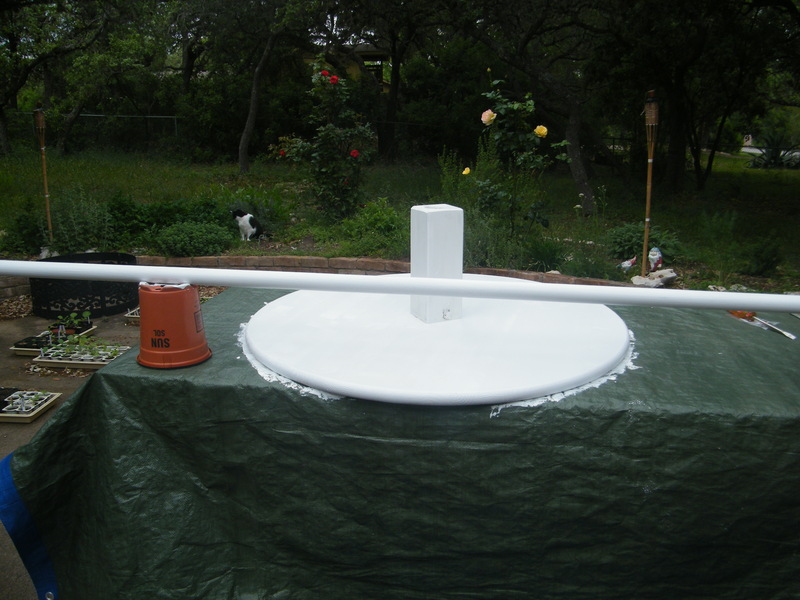 We also picked up a small can of exterior glossy white latex paint, and painted the parts with three coats. At first I was tempted to varnish the pole instead, since I usually prefer a natural wooden look to things rather than paint, but I finally decided on glossy white because I thought it would stand out nicely in the field and look nice with the pastel ribbons. Now, on to the ribbons, which turned out to be the hardest part. Martha says to use six, 10 yard rolls of 1 1/2 inch wide satin ribbon. She says to attach each ribbon in its middle between the wooden disks, so 5 yards hangs off each side. We soon found out that 10 yard rolls of satin ribbon are extremely hard to find! The nearest craft store to us is Hobby Lobby, which we would rather not patronize. We drove about 30 miles to the nearest Michael’s, and almost all of their 1 1/2 inch satin ribbon was in 4 yard rolls. We were able to find only 1 green 10 yard roll, and one turquoise 15 yard roll. We went ahead and bought those, and then bought a few 4 yard rolls anyway. We kept the receipt in case we found some more 10 yard rolls somewhere else. A few days later I drove 20 miles in the opposite direction to Joanne’s Fabrics to see if they had any 10 yard rolls. They only had 4 yard rolls, but they were cheaper than the Michael’s ones, so I bought some of those too. We decided to cut the 15 yard roll down to 10 yards, use our two 10 yard rolls the way Martha says, and staple the 4 yard rolls on their ends instead of their middles and just hope they’re long enough. 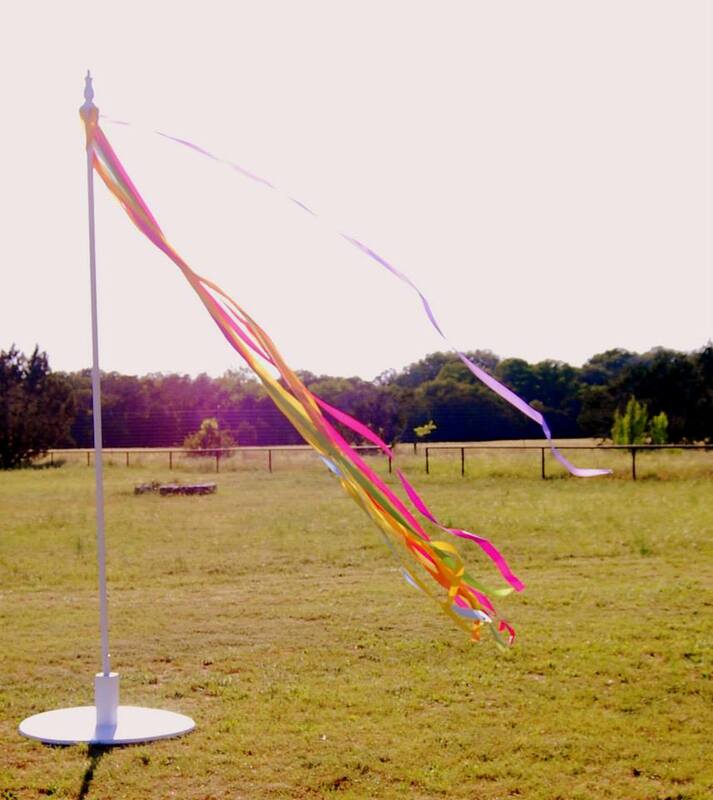 However, when we attached the ribbons to the pole, for some reason the 4 yard rolls ended up being longer than the 10 yard rolls. I have no idea how that happened, since the 10 yard rolls should have had 5 yards on each side, unless the length they say on the roll is not exactly the real length for some reason. We ended up removing the 10 yard rolls and using all the 4 yard rolls we had from both stores so they’d all be the same length. Phew! That was a bit of a pain, but at least it all worked out in the end, and I didn’t have to buy anything from Hobby Lobby. (I did go there just to see if they had 10 yard rolls, but they only had 4 yard rolls too.) I used a lighter to melt the ends of the ribbons so they wouldn’t unravel, and they turned out to be just long enough. 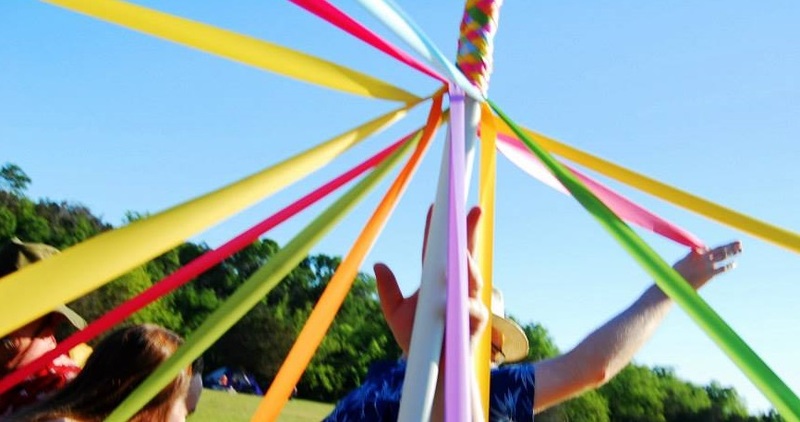 When it comes to Maypole ribbons, the longer the better, but good luck on finding any satin ribbon longer than 4 yards! I couldn’t even find any listed online. I have no idea where Martha got her 10 yard ribbons from. Now we have a Maypole that will hopefully last us many May Days to come.